Immunotherapy is at the forefront of the burgeoning treatment landscape in renal cell carincoma (RCC), according to David McDermott, MD. For example, the FDA approved nivolumab (Opdivo) in November 2015 as a treatment for patients with metastatic RCC following prior antiangiogenic therapy. The approval was based on the phase III CheckMate-025 trial, in which nivolumab reduced the risk of death by 27% versus everolimus (Afinitor) in this setting. As ongoing trials continue to evaluate nivolumab and other immunotherapies in RCC, oncologists are striving to tailor treatments to the right patient populations. “We’re always trying to improve our selection of patients, coming up with predictive markers to identify who might benefit before we start any treatment,” said McDermott. 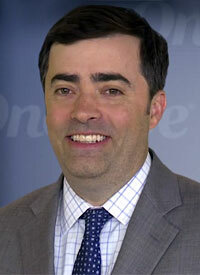 In an interview with OncLive during the Physicians' Education Resource 1st Annual European Congress on Immunotherapies in Cancer, McDermott, associate professor of Medicine at Harvard Medical School, and director of the Biologic Therapy Program at Beth Israel Deaconess Medical Center, discussed recent developments with immunotherapies in RCC, as well as what the future holds for these agents. OncLive: Could you provide an overview of your presentation at this meeting? McDermott: We talked about the advances in kidney cancer as they relate to new immunotherapies, focusing a lot on these new PD-1/PD-L1 pathway inhibitors, agents like nivolumab and atezolizumab (Tecentriq) that are in clinical development, with nivolumab being approved for patients who have failed prior VEGF-targeted therapy. Atezolizumab is being tested in phase II and phase III trials, looking at it alone and in combination with VEGF blockade with bevacizumab (Avastin). Can you compare and contrast PD-1 (nivolumab) and PD-L1 (atezolizumab) inhibitors in this setting? We often get asked which one is better, PD-1 blockade or PD-L1 blockade. We have almost no head-to-head data, so we don’t really know. There’s a perception that potentially blocking PD-L1 may be less toxic, so it may offer some advantages when we’re talking about combinations, but that remains to be proven. PD-1 may be somewhat more efficacious, but both are active in kidney cancer, and both are being explored in combination studies in patients who have not been treated before. Are there any other ongoing trials in this space that you are particularly excited to see the results of? There are several phase III ongoing trials in the frontline setting. Now that we know that PD-1 works for patients who failed prior treatment, the question is, how can we make it work better? The hope is that through combinations, we’ll not only see higher response rates, but also improvement in survival, and potentially improvements in the tail of the survival curve, leading to some remissions for patients. We’ve seen that in other cancers, like melanoma, with a combination of PD-1 and CTLA-4 blockade, in the hopes that we would see similar things in kidney cancer, as well as the combinations of PD-1 and anti-VEGF strategies. There are several phase III trials looking at that, combining 2 effective approaches for kidney cancer, hoping that together, they’ll lead to improved outcomes. What about biomarker development in this space? It’s a complicated subject. We’re always trying to improve our selection of patients, coming up with predictive markers to identify who might benefit before we start any treatment. That’s particularly important when we talk about drugs that are expensive and drugs that have side effects, particularly when given in combination. We’ve looked at the impact of tumor heterogeneity on our ability to create new biomarkers for immunotherapies. And it’s going to be a problem; it’s going to be an issue for kidney cancer, which tends to be a very heterogeneous tumor. If you sample one part of the tumor, you might get a different view of the cancer than if you sampled a different metastasis, or a different part of the primary tumor. So we’re continuing to try to figure out, what’s the best tumor to sample, and how much should be sampled? Should it be the primary tumor, or the metastases? How recent should the tumor biopsy be? How big should the tumor biopsy be? These are all questions we hope will narrow down the population of patients who should get this treatment. Right now, these drugs are given to all patients. When you look at the activity of PD-1 blockade, at least one-third of patients derive no benefit; they just progress. Therefore, it would be nice to identify the patients who won’t get any benefit, so we can avoid giving them an ineffective treatment. But when you look at potential selection factors, PD-L1 is probably also only positive in maybe a third of patients. So how do we identify that larger group that will benefit? We probably see a benefit in maybe 50% or 60% of patients. So what we’re trying to do is add other analyses of the tumor, trying to look at not just the tumor features, but the immune cells in the tumor, looking at the tumor under the microscope. What is the tumor expressing in terms of DNA mutations, RNA expression? We are trying to fold that into a multifactorial model that will hopefully improve our selection criteria. What do you see on the horizon for the treatment landscape in kidney cancer? Hopefully, we’ll get better not only at selecting patients for treatment, but also moving these treatments earlier into the course of treatment. We need to bring it to the frontline in the right patients so we can get that durable benefit earlier. But maybe we also need to bring it to the adjuvant setting. There are several trials that are going to be launched, which will be looking at patients, giving them immunotherapy either before or after the tumor is removed, as a way of trying to prevent recurrence. That’s potentially where we can make the biggest impact with immunotherapies. What we’ve seen in melanoma is a 25% reduction in risk of recurrence when we give CTLA-4 blockade after surgery. Hopefully, we’ll see similar things when we look at the kidney cancer trials, because I think that’s where we can really make a big impact over a large group of patients, and prevent patients from developing metastatic disease.